A popular bat-and-ball game after baseball, Cricket has gained popularity especially in countries like Australia and England. Essentially, it works like baseball wherein one team bats and tries to score as many runs as possible while the other team tries to limit the runs made by the other team. Like most professional sports, this has not escaped the eyes of bookmakers who offer many betting opportunities for this sport. Due to the enormous selection offered in Cricket betting, International Cricket is beginning to emerge as one of the most popular betting sports in the world. Bookmakers try to appeal and get the heart of new bettors by offering free ticket bets available on most of their websites. These free ticket bets will give a new bettor an opportunity to test the waters. Among the most popular betting options for cricket are the Match betting, Top Run-scorer, Highest Opening Partnership and 1st Innings Lead. Match Betting is the easiest and most popular among the betting opportunities in Cricket. All the punters have to do is pick the team they think will win the match. Top Run-scorer is for the punters who want to place a bet on who he thinks will be the top run-scorer of a team. In Highest Opening Partnership, punters can pick an opening partnership that will reach the highest score and in 1st Innings Lead, punters will place a bet on the team they think will have the highest score in the first innings. These four are the most bet-on opportunities in Cricket betting and also the most favourite due to its ease. Other betting options are available for cricket such as Most Match Sixes, Next Dismissal, Innings Runs, Session Runs, Dismissal Method and Next Over Runs. The opportunities for betting on this sport are endless and all you have to do is watch your bet and watch the sport unfold. The websites by online bookmakers are being helpful to both novice and expert bettors. They offer the latest news, tips and happenings in the betting world. Some websites also offer stats service that will help a bettor to make a decision. Due to the odds being available online, international bettors are also welcome to place a bet. Online betting has never been this easy that everything a bettor needs to know is available online. All transactions can happen under your fingertips. 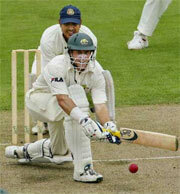 Cricket is an all year round sport that satisfies the insatiable hunger of avid Cricket bettors. The betting market is always available up to date during the Test Cricket (the long version of the game), One-day International Cricket (a Cricket match played by international teams) and Twenty20 Cricket (a shortened version of the game that has been a phenomenon over the past two years). Whatever match you pick, you will surely have a grand time in Cricket betting especially if you’re a sports lover yourself. Those who are entertained by the sport will also be entertained with the betting opportunities made available by the growing number of online bookmakers especially in the UK.